I started playing trumpet in 4th grade, and continued brass instruments though my teens, ending up marching in drum and bugle corps. Cool stuff - I still catch shows when I can. I kinda of stole my brothers guitar at about 18, and started learning all the Stones, Neil Young, etc., everybody else was playing. John Prine's first album was a revelation. Here was a guy with hugely entertaining songs who didn't actually sing or play guitar all that well. Well, hell, no reason I can't do that! I'm still working on it. One of my grandpas worked for the coal mine; the other was a Texas dirt farmer; my dad sang me hillbilly songs growing up. I learned to talk in Texas, and went to bluegrass festivals down in Kentucky before I could play the music. I reckon you can hear all that in my songs. The first concert I went to was Yes, with a opening band that was just starting to get airplay, called The Eagles; tickets cost $4.50. 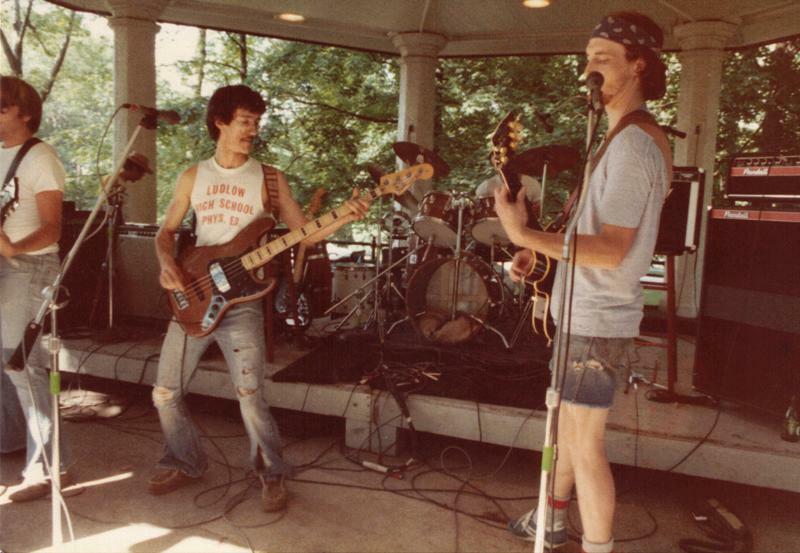 Later I played in what was to my knowledge the first punk band in Cincinnati, in 1980-81. Our lead guitarist walked off stage during our first concert, ending that phase of my music career. These days my music runs pretty deep in the roots/Americana vein, also tapping into Celtic styles. I write a lot of songs that get mistaken for folk songs, and maybe they are. I play a strong rhythm guitar and banjo, and love to mess around with - and sometimes perform on - mandolin, pennywhistle, harmonica, and whatever else is laying around. My music has been compared to that of Woody Guthrie, John Prine (yay! ), Pete Seeger, Warren Zevon, and Mark Twain, though as far as I know Mr Clemens was not a musician. Luck and perseverance have brought me talented musical co-conspirators such as Annie Rettic and Richie Strell to execute live shows and recordings. I've got my calloused fingers in some other musical pies. Working through Resounding Joy, every week I take my banjo down to a local nursing home and play old songs for old people. Some of the ladies can't hold a conversation, but they can bang a drum in time and sing Oh Susanna. I book local and touring musical acts for the San Diego Folk Heritage concert series, helping keep the folk arts (and artists) alive for another generation. It's a joy to see several generations of dancers sharing the floor during a lively fiddle tune. I'm also dooing a weekly spot on Listen Local Radio featuring SDFH artists. The San Diego music scene is very supportive; the Songwriters Meetup and Poway Folk Circle are two prime examples. Life is good; musc makes it better. Enjoy! "JT" is for John Thomas. Back in the day there were four of us Johns who liked to ride around together and party. After a number of communication failures, we settled on first and middle initials - problem solved. Through family records and the research of the Latter Day Saints, I've traced my ancestry to a mule stealer, soldiers on both sides of the Civil War, a Governor of colonial Virginia, and numerous prominent European figures, including William the Conqueror, Charlemagne, and a couple of obscure saints. One web site shows a path back to Adam (that Adam), but some of the links are questionable. I once shared a stage with Jerry Springer (that Jerry Springer), back when he was a Cincinnati city councilman. This was before he (Springer) resigned over the Kentucky prostitute scandal, and before he was elected Mayor. I once slept under Walter Cronkite's piano in the living room of his Martha's Vineyard house. It's a long story. I once spent 3 days in an Indiana cave, 2 and a half of which were without food or light. There will be a song one day. I once spent a week on the beach of Bahia de los Angeles, Mexico, waiting for a shipment of gasoline that would allow travel back toward the States. It was way more enjoyable than the cave incident. I've ridden my motorcycles over 11 countries on 3 continents, and, uh, a whole bunch of states. All of them in the rain, it seems like.